I’ve had a number of occasions where I needed direct access to an Android device that wasn’t connected to the computer in front of me. I can usually SSH into the remote host machine and use ADB to try to debug the situation. If the simple stuff doesn’t work, I eventually start using ADB screencap to get a look at what’s on the device. If I’m lucky, I can remote desktop to the host. If not, I end up copying the images back to my machine to view them. Surely there is must be an easier way. There is! I found the OpenSTF project which basically allows you to get web-based control of the Android and iOS devices. Just install the system on the host machine and install an agent on the Android devices. It looks pretty cool, but always seemed like overkill when I was in a remote debug situation. So I decided I’d start hacking together a really simple system in Python. I started with the simplest Python API server I could find. Then I added a fairly basic webapp front-end. The result is Web ADB. It’s a very minimal Python API server, which also serves up a basic single-page webapp. The approach is pretty simple: run ADB commands via Python, parse the output, send the results back through the API response. 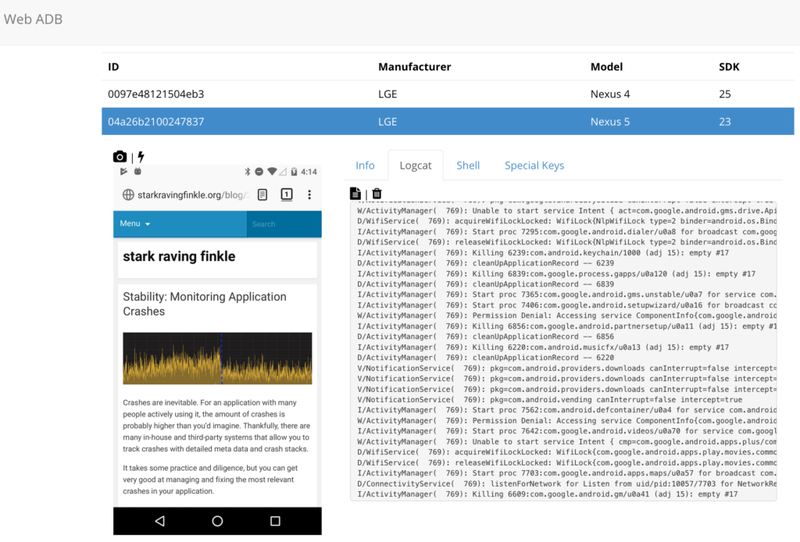 The API supports getting attached devices, getting a screenshot of a device, sending key presses and screen taps, and even rebooting a device. The webapp just uses the API to make something useful. Maybe the only cool feature is clicking on a screenshot will send a tap to the device, then update the screenshot. I have some ideas for other features, as time permits.